Japanese satellite built by the Space Oriented Higashi-osaka Leading Association, Osaka, carrying a cloud cover imager. Status: Operational 2009. First Launch: 2009-01-23. Last Launch: 2009-01-23. Number: 1 . Gross mass: 50 kg (110 lb). Family: Earth, Earth resources. Country: Japan. Launch Vehicles: H-II, H-IIA 202. Launch Sites: Tanegashima. Bibliography: 4. 2009 January 23 - . 03:54 GMT - . Launch Site: Tanegashima. LV Family: H-2. Launch Vehicle: H-IIA 202. 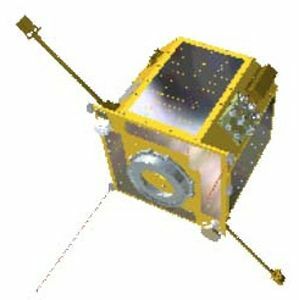 SOHLA-1 - . Mass: 50 kg (110 lb). Nation: Japan. Agency: Mitsubishi. Class: Earth. Type: Weather satellite. Spacecraft: SOHLA. USAF Sat Cat: 33495 . COSPAR: 2009-002D. Apogee: 667 km (414 mi). Perigee: 654 km (406 mi). Inclination: 98.00 deg. Period: 98.00 min. Satellite built by the Space Oriented Higashi-osaka Leading Association, Osaka, carrying a cloud cover imager..